This paper offers a reading of the Peruvian LGBTQ theater play Desde Afuera (From the Outside). Contrary to usual modes of understanding travestis as a minoritarian group, this paper suggests the possibility of envisioning travestismo as a new form of constructing peruvianness. It focuses on the possibilities of the collective pronoun nosotrxs and its power to disrupt the living legacy of racism, homophobia, and transphobia of the Peruvian nation state. This paper asks: Can the x of nosotrxs be read as a scar? Further, is there anything for travestismo in thinking of the scar in genealogical terms? In the production of a travesti nosotrxs can the scars be distributed less asymmetrically and can the production of racial and gendered scars be less definitive and tortuous? Can scars be transformed into sites of love and reparation? And finally, can nosotrxs respect for opacity become the seed for social and political transformations? Giancarlo Cornejo is a PhD candidate in the Department of Rhetoric with a Designated Emphasis in Women, Gender and Sexuality at the University of California, Berkeley. 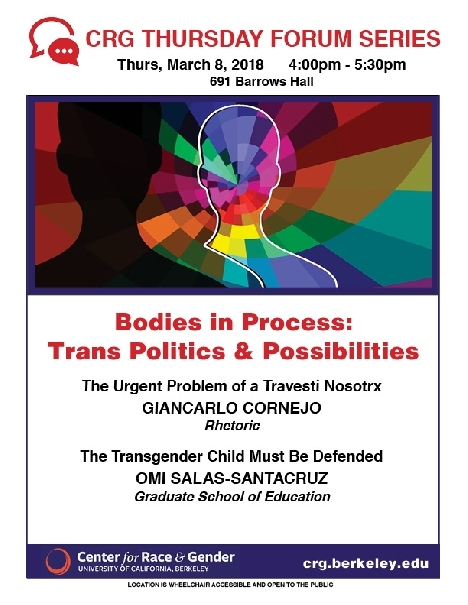 His dissertation, Travesti Memory and Politics: Toward a Peruvian Transgender Imaginary, understands travestismo (a local, not fully translatable trans* identity) as a critical tool to read the unstable and contested production of gender, sexuality, and race in contemporary Peru. His essays have appeared in journals such as TSQ: Transgender Studies Quarterly, Estudos Feministas, and Íconos. Omi Salas-SantaCruz is a doctoral student in the Social and Cultural Studies program at the Graduate School of Education with a Designated Emphasis in Critical Theory and Women, Gender and Sexuality Studies at UC Berkeley. Their research interests include transgender studies, queer and trans* Latinx literacies, non-white sexual cultures in educational settings, and queer of color theorization in education research. Omi serves as the graduate student representative of the Chancellors Advisory Committee on LGBTQI Communities at Cal and works as a Graduate Research Associate at Berkeley Law. Omi is a University of California Berkeley Chancellors and Tillery Foundation Fellow and holds a M.A. degree in Sociology from Columbia University and a B.A. from UC Berkeley in the same field.